Nariko is getting her own movie. That Ratchet & Clank movie trailer sure came out of nowhere, huh? Here's another tidbit of news from a little further out of left field; A studio named Blockade Entertainment is working on a CG movie based on Ninja Theory's Heavenly Sword. The movie is currently in production at the studio and was scripted by Drive Angry writer, Todd Farmer. Anna Torv will be returning to voice Nariko, but unfortunately, Andy Serkis won't be reprising his role as the evil King Bohan. Instead, Bohan will be played by Alfred Molina, who you'll most likely recognize as Doctor Octopus from Spiderman 2. Though often referred to as a flop, Heavenly Sword actually wasn't the expensive catastrophe many seem to think. It sold relatively well for a new IP, clearing a million copies sold, even as the PS3 struggled to match the install base of the 360. It received a warm critical response, with a Metacritic score of 79 and a generous user score of 8.4. But the game isn't really remembered for its mechanics as much as its bizarre plot - courtesy of Mirror's Edge pensmith, Rhianna Pratchett - and its stellar voice acting. 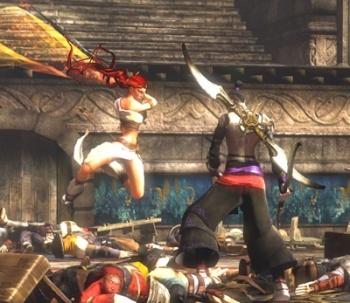 Heavenly Sword isn't exactly a huge franchise at this point, its planned sequel having been scrapped years ago, but, much like Ratchet and Clank, Noriko did appear in the recently released PlayStation All-Stars Battle Royale. Could this be a start of a movie series based on those characters? Is there a vague possibility of a Gravity Rush movie, or alternatively, an 8-Mile-esque Parappa the Rapper movie? Please let that be the case.